"David Grant is . . . recognized as the dean of British gun photographers, and his striking images, nicely paired with Venters' words, celebrate the venerable tradition of British gunmaking." 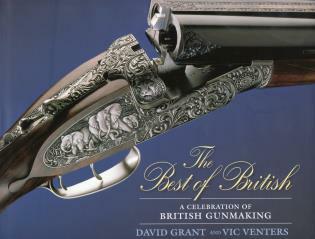 Internationally renowned photographer David Grant has photographed the best examples of contemporary British gunmaking, along with choice historical examples. Vic Venters provides detailed captions describing the guns and the craftsmen who built them. An appendix provides history and background on the various gunmakers and companies including contact information. David Grant studied photography at Lanchester College. He has been commissioned to photograph guns for leading companies and he has also written reviews on guns for Shooting Times and The Shooting Gazette in the UK and Shooting Sportsman in the US. Vic Venters is a lifelong shooter who attended London University. He lives in North Carolina. He is Senior Editor of Shooting Sportsman. Ron Putz lives in England.